Today I have a bit of a treat – an AudioBook review with a short excerpt from the title – giving you a sense of Fiona Wood’s lovely conversational style of writing, that brings you right into the story with the characters as they relate to you as friends…. If you read lots of teen / YA titles, you soon find yourself in a story that feels familiar: characters are so similar as to be clones, their romantic aspirations seem to rise no higher than a triangle, there are parental miscommunications, difficulties in school, and a large and overbearing sense of ‘persona’ being much more important than the person, at least superficially. This is where the Australian YA market has brought a change for the better to readers and fans of teen/YA titles everywhere. Each title that I have read from an Australian author has been pointedly different and special, with a unique perspective and solid voicing that often gets missed in the most popular titles out there. Fiona Wood brings us Wildlife, a story based on two year 10’s (that would be high school sophomores to those unfamiliar) and their navigation of a school term in a Mountain Wildlife camp – away from all familiar and comfortable ‘civilized’ amenities. Sibylla is the first voice we meet, and she is instantly engaging and easy to relate to. During break she had a ‘moment’ with Ben, the most popular boy in Year 10, and their kiss was recorded for posterity on a billboard. Now, what was a private and rather interesting side-note in her life is a public event: forcing her to reevaluate her position at school, in life, and really reestablish her own sense of self. The second voice is that of Lou (who was introduced in Six Impossible Things) as the new girl in school, who is, by choice, desperately trying to isolate herself. “Now all I have to do is blend in, zone out and start crossing off the days on my cell wall”. Lou is utterly isolated within walls of her own making: combining anger, grief, loss and utter frustration from a terrible loss that has shaken her to her core. She isn’t at all interested in the goings-on with her classmates or their social concerns, let alone the tentative and not so tentative dalliances with romance. These two perspectives are alternated as the girls first are embroiled within their own concerns, and gently spread out to encompass mentions and questions about one another as they start to form a friendship that is at first based only on proximity. Wood writes in a very conversational style, that brings emotion and understanding of the two characters with her beautiful phrasing and solid delineation of the two characters. Surprisingly, the voices of Sib and Lou are so distinct and unique that their personalities are clearly presented, and there is no difficulty in determining who is presenting a scene or perspective. With the added skillful setting of the world around them, Wood presents the story with vivid imagery and insets of family life, interactions and simple daily activities and gripes that will feel familiar to everyone. Narration in this story is provided by Candice Moll and Fiona Hardingham. Both narrators have lovely accents, one just slightly different from the other, and both wholly Australian, that will also clue readers/listeners in to the fact that accents in Australia are not all “Crocodile Dundee” and “Steve Irwin”. Both narrators give appropriate pauses, emotional emphasis and tone with deliveries that delineate the characters with ease, as well as presenting a sense of interior voices contrasting with conversations or retelling to others. Neither over-reach for emphasis or to make a point, the emotion and impact is evident in the words written on the page so handily by the author. Perfect for readers / listeners from age 12 and up, this story is incredibly well-written with plenty of moments to remember, showing teenagers as the wholly complex and complicated beings that they are, without delving into loads of stereotypical or generalized behaviors. Fiona Wood is sure to become a favorite of many readers. At least twice a year my godmother, who is some big deal advertising producer, comes back to Melbourne from New York to see her family and people like us, her old friends. Her name is Bebe, which is pronounced like two bees, but we call her Beeb. She hasn’t got kids so I get all her kid attention, which to be completely honest is not a huge amount. But it’s ‘quality time’. And quality presents. Especially when I was little. When I was five she organised for me to adopt a baby doll from FAO Schwarz. She took photos of me in the ‘nursery’ – they actual y had shop assistants dressed up as nurses – and I showed them at school. That was when I started being friends with Holly. As she looked at my doll, Meggy MacGregor – who had a feeding bottle, nappies, designer clothes, birth certificate and a car capsule – I could see her struggling. It was jealousy/hatred vs admiration/envy, and lucky for me admiration/envy won the day. She’s a good friend, but a mean enemy. We were at the beach house, lounging around in a delicious haze of lemon poppy seed cake and pots of tea, talking about digging out the wetsuits for a freezing cold spring swim and whether or not sharks have a preferred feeding time. I was lying on the floor with my feet up in an armchair. Toenails painted Titanium – dark, purplish – drying nicely. I’d just put down Othello for a bout of Angry Birds. My sister Charlotte, thirteen going on obnoxious, was laughing too loudly at a text message, hoping one of us would ask her what was so funny. Dad was doing a cryptic crossword. Mum was answering emails on her laptop even though she was supposedly on holiday. ‘Sexually transmitted disease never sleeps,’ she said when I reminded her of the holiday concept. Gross. She used to be a regular doctor, but she kept getting more and more obscure qualifications and went into community health and health policy, and now she basically runs the free world from the Sexually Transmitted Infections Clinic in Fitzroy. If you can think of a more embarrassing place than STIC to visit your mum at work, think again, because there isn’t one. Holly loves it. Anything for attention. We went there after school on the last day of term for emergency gelati money so we’d have the necessary energy required to trawl Savers, and this old woman gave us the foulest look when we hit the street. ‘They broke the mould after you two,’ my dad said. Meaning Beeb and Mum. It never works when my dad tries to give a compliment; he’s simply not that charming. ‘Thanks,’ I said, thinking interesting is after all a modest claim. I must have sounded way more offended than I felt, because when I glanced up from my screen all eyes were upon me. Upside down, disconcertingly, because of me lying on the floor. 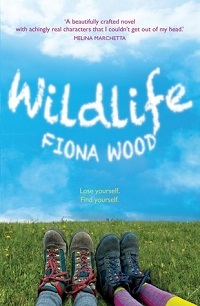 Fiona Wood is the author of young adult novels, Six Impossible Things and Wildlife. Her third book, Cloudwish, will be out next year. Before writing YA fiction, Fiona worked as a television scriptwriter for twelve years, writing everything from soap, and one-hour adult drama, to children’s drama. Prior to this she dropped out of law and completed an arts degree, both at Melbourne University, worked in marketing and in arts management, did some freelance journalism, and studied screenwriting at RMIT. She has served as a judge for the AWGIE Awards (Australian Writers’ Guild) and is an ambassador for The Stella Prize Schools Program. She has two YA children, and lives in Melbourne with her husband.